If you have a presence on social media, chances are you are familiar with Kim Kardashian. From reality TV star to a new makeup mogul, Kardashian has become famous for her unique and oddly symmetrical beauty. The success of her makeup line is due largely in part to her own amazing ability to contour her facial features. While Kardashian has been the source of plastic surgery speculation in the past, the one thing she admits is her flawless nose is achieved through extensive contouring techniques. So what does Kim Kardashian have to do with rhinoplasty patients? It’s the fact that her “flawless” nose is a manipulation, contoured with makeup, to look amazing. Social media is flooded with facial contouring from the hairline to chest, giving many patients unrealistic expectations about what their rhinoplasty results should be. 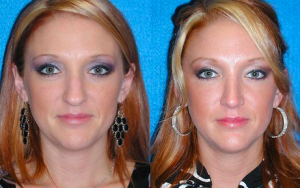 More people are turning to surgery to help achieve their ideal nose. When you schedule a consultation with a plastic surgeon, you are seeking expert advice on how to enhance your appearance. The best rhinoplasty results are achieved not when you dramatically change your features, but when you restore balance and harmony. We strive to always achieve natural-looking results, sculpting a nose that looks like it has always been yours. These thin, overly sculpted noses that are associated with facial contouring can often appear fake and unattractive when created using surgery. Using celebrity photos and models to help illustrate your desires to your plastic surgeon is great. But it’s important to remember that these photos are to reference characteristics that you like, such as size, shape, or proportions. What you shouldn’t expect is for your nose to look exactly like anyone else’s. Beautiful celebrity noses are usually in balance with the rest of their facial features. The structures of their face enhance the attractiveness of their nose. Somebody else’s nose transplanted onto your face may not translate as well. Focus more on achieving a look that is harmonious with your existing beauty. You should always choose plastic surgery to boost your confidence, and because it’s a decision you’ve made on your own. Remember that pictures you see on social media can be photoshopped, altered, and contoured. Not even those people have the exact nose you’re seeing. If you are unhappy with your nose, seek advice from a professional on how you can restore facial symmetry and enhance one of the most noticeable features of your face. If you have questions for Sacramento cosmetic surgeon Dr. Scott Green, please fill out the contact from below.